We beg to differ with some of Kamp’s choices, though. You will never catch us eating Cheez Whiz; but then again, we don’t consider ourselves Food Snobs. Rather, we are Food Enthusiasts. P.S. Romanesco is not a sauce, but an Italian dialect spoken in Rome. (Originally it was spoken only inside the walls of the city, while the little towns outside the walls had their own dialects. Talk about territorial!) Romesco is a famous sauce originating in the Catalonia region of Spain, most often served with seafood. It is typically made from almonds and/or hazelnuts, plus roasted garlic, olive oil and small, dried red peppers called nyores. Other ingredients can include roasted tomatoes, red wine vinegar, onion, fennel and mint. 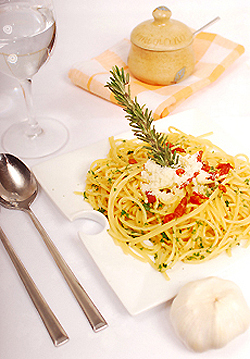 The sauce, also called romescu, can be served with a poultry, vegetables and other foods as well. Feeling like a Food Snob yet? Since they debuted last year, we’ve been gaga for Altoids Dark Chocolate Dipped Mints. When we heard through the food grapevine a few months ago that there was a recommendation in to discontinue them (because they were not on in sync with the “curiously strong” branding), we stockpiled them. From the TV spots that are now running, it seems that we’re not the only ones who want our Altoids curiously coated in chocolate. For only 15 calories for two pieces, you can have a chocolate mint fix as often as you like. Our favorite chocolate mint fix. The Chocolate Dipped Altoids are available in three flavors: Dark Chocolate Dipped Peppermint (easily identified by a white ribbon on the package), Ginger (gold ribbon) and Cinnamon (red ribbon). The chocolate coating mitigates the fieriness of the cinnamon and ginger flavors. But if it’s fire you want, the plain Ginger Altoids are so curiously strong (but exciting so), that the Original Peppermint Altoids had better not challenge them to a fight. 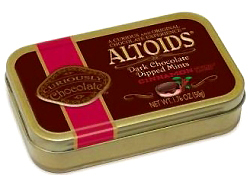 If you can’t find the chocolate-dipped Altoids locally, you can find them online for about $48/dozen. They make great stocking stuffers. Ciao Bella Gelato: A low-calorie sweet treat. Ciao Bella, one of our favorite purveyors of authentic gelato and sorbetto, has introduced two seasonal fall flavors, ideal for entertaining or making family dinners a bit more special. When your guests can’t find room for a piece of pumpkin pie, or want something on the lighter side, there’s always room for gelato or for lower-calorie, dairy-free, fat-free sorbetto. Pumpkin & Spice Gelato, pumpkin accented with clove and cinnamon spices, is a perfect addition to holiday meals. It also complements a piece of chocolate cake for everyday festivities. Cranberry Orange Sorbetto, a favorite from last year, returns this month, in time for Halloween. Both will be available through the end of the year. 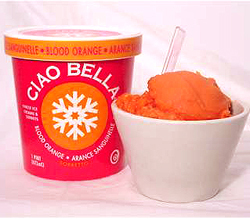 One of our favorite flavors, Blood Orange Sorbetto, is available year-round and also has the color and flavor of fall. Both of the seasonal flavors as well as 19 others (including the Blood Orange Sorbetto) can be purchased online at CiaoBellaGelato.com (4-pint minimum). For your nearest retailer, call 1.800.GELATO.3. If you love good food, what could be better than the chance to win a box of it each week? That’s the idea behind the Goumet Giveaway, launching today on TheNibble.com. Each week, a different prize, from chocolate to cheesecake to seafood to steak, will be given away. All you have to do to enter is answer a few fun trivia questions relating to the product—and you don’t even have to answer correctly to be entered to win. You’ll get the correct answers after you submit yours, so the “bonus” is that you’ll build your knowledge of fun food trivia. Read the full press release about Gourmet Giveaway, and head on over to enter. This week, win a pasta gift box. Photo by Adam Kulesza | IST. organic and four natural flavors. Americans are drinking more water, but also more sweetened, flavored water. 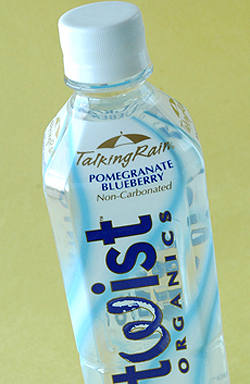 The success of Glaceau’s Fruit Water and Vitamin Water have spawned other lines, and Twist is the first organic one. What makes water organic? First, it’s artesian well water, not municipal water which has been treated with chemicals. Second, the sweetener is organic (in this case, agave nectar) and the fruit flavorings are organic as well. Twist Organics’ four flavors include Mango Açaí (our favorite), Mandarin White Tea, Pomegranate Blueberry and West Indies Lime. The Naturals line is made with the same artesian well water, but with a non-organic sweetener (pineapple juice) and flavorings. It’s available in Lemon, Mandarin, Marionberry and Peach. The Naturals are less sweet than the Organics, and overall, both lines are less sweet and more natural-tasting than the other flavored, sweetened “juice waters” we’ve tasted. If you’ve found the other brands a bit too much, you may prefer this Twist. Read our full review in THE NIBBLE online magazine.